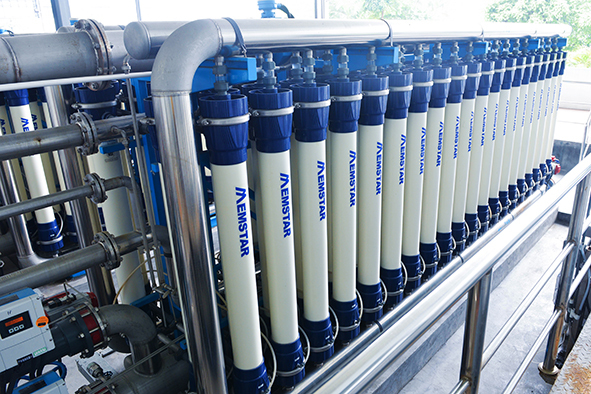 Continuous Membrane Filtration (CMF) is a water treatment technology that utilises microfiltraion / ultrafiltration membrane to achieve removal of very small contaminants in water. A typical CMF system is made up of a membrane filtration unit and a membrane cleaning system. CMF technology replaces the traditional coagulation, flocculation, sedimentation and multimedia filtration processes which are used to remove suspended solids and colloidal particles in water. When compared to the traditional filtration process, CMF simplifies the operation, reduces operating cost and space, and produces better and more reliable water quality. As bacteria and water borne pathogens are also removed, CMF is used to produce drinking water from river water, ground water and surface water. We use PVDF membrane which has high flux, low pressure drop and great chemical resistant properties. With the advanced membrane material coupled with our proprietary membrane cleaning technique, we are able to reduce membrane fouling and prolong useful membrane life.